After the priest at Blessed Sacrament Catholic Church in Seattle, Washington read these words from Luke’s Gospel yesterday morning, I said four special prayers. 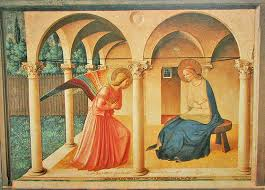 The first was a prayer of thanks for how fortunate I am, or rather we all are, that Mary gave her fiat, her “Yes”, to the Lord’s angel Gabriel at the Annunciation. I thought about the love she must have had for God, a love based on an unshakable faith. I wondered if she had any idea of the unfathomable joy she would experience during the life of her Son, as well as the excruciating heartbreak she would endure at His death. Did she ever doubt her decision? I don’t think so. I believe she stuck by her words, “May it be done to me according to Your word”, her entire life, even at Christ’s death. Hallelujah, through her, a miracle was born! My second prayer was also one of thanks for how fortunate I am, as well as my entire family, that my daughter and son-in-law, who live here in Seattle, chose to say “Yes” to God’s plan of having their own child, our first granddaughter, who is now two months old. And, I am thankful for another daughter and husband who did the same and are expecting our second grandchild, a son, in the next few days. Likewise, I wondered if they have an idea of the joys and the heartbreaks they will experience as parents. But, I know, no parent does until they actually happen. I said a prayer of thanks for their love and their courage to be good parents. Hallelujah, through my daughters, miracles are being born! The third prayer was for all the children whose parents had neither the unselfish love nor the courage to follow through and bring them into this world, parents who chose to follow their own will and said “Yes” to abortion and “No” to the plan which God had already set in motion for them. Lord, bless the souls of these millions of children who never had the opportunity to carry out Your will here on earth, nor the chance to experience the joys of life. And, finally, my fourth prayer was for all the mothers who have said, and all the mothers who will yet say “No” to God’s plan and abort their babies. I am sure, for many of those mothers, there is deep emotional pain and tremendous heartbreak that accompanies their decisions. Unfortunately, I know there are many mothers who never bat an eye. Lord, please have mercy on these women, forgive those who have contrite hearts, and help those who do not to see the error of their ways. Lord God, as I await the birth of your Son, Jesus, I give you thanks for our Mother Mary, my mother, my wife and the mother of my children, and mothers everywhere who have said “Yes” to your will. May You grant them a special place in Your Kingdom. Amen. Hit the nail on the head. Life!!!!! He gives it to us and can take it when he wants. We are all lucky he picked us for his children. What a fantastic prayer now at this time for life of new babies. And also prayer for those struggling on their thoughts to abort. I pray they choose life. I also pray that God is looking down upon his kingdom and is pleased with his children. We are very lucky he forgives us. Norm, I hope you and Isabella have the merriest of Christmases. Embrace her, she is a true gift from God. Anette can’t believe your girls are old enough to be having babies! She didn’t seem to have a problem with you being a grandparent though! Hope you and your family are doing well. Say hello to all of them from Mikey Montana. Hey, Mikey! It’s been a long time my friend. Yes, it’s hard to believe but it’s true. I’m a grandpa and loving it. My oldest daughter, Sara, here in Seattle; and daughter #3, Lisa, in Kansas City. I think we may be in your “God’s country” next year some time. Will let you know. Thanks for reading and have a very Merry Christmas ! Thank you, Audrey. I hope you and Dean have a great Christmas!